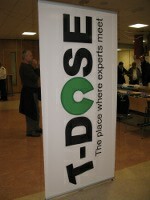 The opensource conference T-DOSE in Eindhoven, Netherlands took place a bit more than a week ago. It provided good coverage of different subjects, including KVM, Devops, Open GIS, puppet and lots more. And, of course, Zabbix. It’s been a while since the first public release of Zabbix – almost 10 years. That’s something worth celebrating, right? There also could be some event where Zabbix users could share their experiences, meet the developers and gain new knowledge about Zabbix. So what’s the plan?